Before I attended the Taste of Melrose Park last year, I think I had been to that near-western suburb exactly once, to buy a couch. I don’t remember how we wound up there, but we found this furniture store where everything looked like it was designed for one of two people: Joe Pesci in Goodfellas (remember those weird buttoned collars that went on the outside of the jacket?) or Joe Pesci in Casino. (I don’t imply any sort of criminal connection, merely that Scorsese in those movies was such a fabulous anthropologist of 60s and 70s fashions among his people.) Somehow, amid all this loud taste, there was one weirdly preppy-looking couch covered, as furniture sometimes was in the 80s, with blue pinstriped ticking material. It was sedate enough— I later realized that between it and my oriental rug, basically I’d decorated my living room with a dress shirt and a tie— and so we came home with it. The couch went away a decade ago but a similar chair, to give you an idea of how my tastes have changed, was subsequently reupholstered in vintage Tiki barkcloth. Color me Pesci. 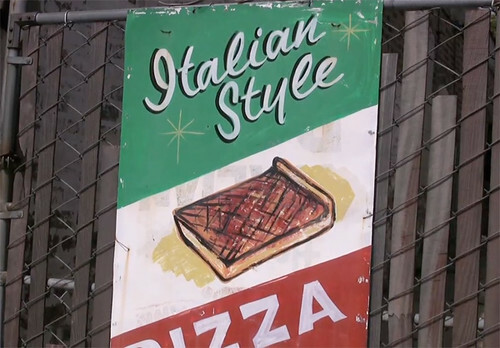 In any case, the Italian-ness, or rather the Italian-Americanness, of Melrose Park was etched in my mind. (More specifically, Sicilian-ness; that seems to be where most of the people I talked to trace their ancestry to.) And certainly visiting Taste of Melrose Park, which as a food event is basically 90% Italian-American, last year didn’t alter that point of view. What did was shooting the next Sky Full of Bacon, shortly to appear, there. As we drove there, I saw that there seemed to be more Mexican food businesses than Italian ones; but that’s true of all but the most concentrated Asian neighborhoods, any more. Plenty of Poles are eating at taquerias in Avondale; that doesn’t mean Polish Chicago is over. But as David Hammond and I interviewed the vendors at Taste of Melrose Park, I began to realize that for many of them, this was a nostalgic event. Maybe even 20 years ago, when I was couch-shopping, Melrose Park was still the suburb that you moved to from the city. But by now the Italian enclaves in the city are virtually extinct— Taylor Street is an Italian-themed drinking strip for UIC students; Noble Square and Heart of Italy are but shadows— and the first, visibly Italian suburb families moved to from the city is beginning to give way to the second suburb, where the Italian-American community assimilates… and disappears. Melrose Park is “the old neighborhood” now, and the Taste of Melrose Park is where you come— from Naperville or Buffalo Grove or Bolingbrook— to see the people you grew up with and eat the food you grew up on. Once a year. Many of the vendors are of an age that you can imagine them moving as children to Melrose Park just after WWII; there are some adult kids working with their parents now who will likely carry it on, and there’s certainly many more happy years of this event to come, but the demographic handwriting is on a distant, but plainly readable, wall. A little to my surprise, then, this video’s theme turns out to be strikingly parallel to my one about Lithuanian Chicago earlier this year. Lithuanian Chicago was much further along the process, but basically, the story was the same— the immigrant community near the center of the city moved to the edge (in this case, Marquette Park within the city), then dispersed into the suburbs where it is only kept alive by organizations, not by an organic community with restaurants and other commercial activity. If more Italian-ness survives than Lithuanian-ness, the reason will likely be because of Italy’s great contribution to American culture (well, along with Columbus and Marconi, I suppose): Italian food. Lithuanian food is a very tiny specialty of food geeks like me, but Italian food’s contribution to American food is more in the nature of a wholesale takeover— not only that Italian foods are so common no one thinks of them as foreign any more, but that the Italian ethos— of seasonality and freshness and simplicity in preparation— has so influenced American dining. That’s the thing that amazes me about Taste of Melrose Park, more than anything. Though some of the vendors are restaurateurs, many must have normal jobs selling insurance or working at the Navistar factory or… well, there’s a hell of a lot of city workers who also happen to have booths. Yet whatever they do the other 362 days a year, they seem to have almost a genetic capacity for dropping it and picking up running a high-capacity restaurant, by themselves, for three straight days in the hot sun. I mean, my family cares about food a lot, I’m merely the most extreme, but I can’t imagine us doing this competently for half a day, let alone three. Yet the Italian-Americans who run the 70+ stands at Taste of Melrose Park all seem to have a fanatic interest in food which translates into competency in serving it at this festival. Bring food up at all, and twenty minutes later they’ll still be talking about it. All of my videos are about the degree to which food matters culturally to somebody, but this one, mamma mia, it’s about a culture where it really matters, to everybody. And that intensity about food will keep restaurants alive, and the restaurants will keep the culture alive… if only as shtick in many cases, but still. Anyway, the video will be up next week. * Unfortunately, you won’t be able to follow up on it and eat the food you see in it for about 11 more months, until the next Labor Day rolls around. But in the meantime, there is one survivor of the old Italian Melrose Park still operating on Lake Street, which was once Italian row (and is now all taquerias). 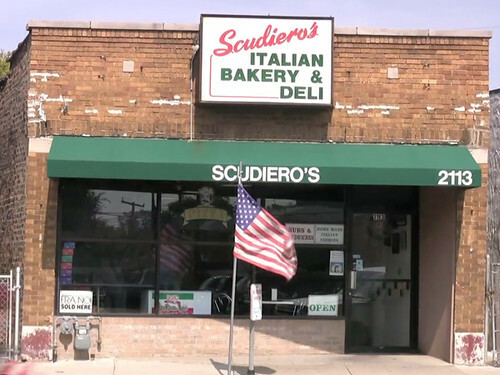 It’s called Scudiero’s (they have a booth in the Taste, but I didn’t interview them). It’s a little Italian deli, with subs and sheet pizza. I stopped in on Tuesday while getting a few last establishing shots and grabbed a couple of slices; it’s not great pizza (the short crust— i.e., made with shortening— is a typical Italian-American touch that may turn off Neapolitan pizza purists, but it does last longer before getting hard in the case), but it’s simple and tastes of exactly what it is, bread, tomatoes and cheese. What do you want for a buck fifty? * Yes, I know I said the next one would be about barbecue. But that one’s gotten more complex, and this one meanwhile was simple by comparison— the shortest shoot I’ve ever done, in fact. (Two days, 4 hours of raw footage. It’s no trick to get Italians to talk.) So it got done first.